These include a slide, cargo net, net bridge, a climbing ramp, stairs, a barrel tunnel and seating on the lower deck of the towers. 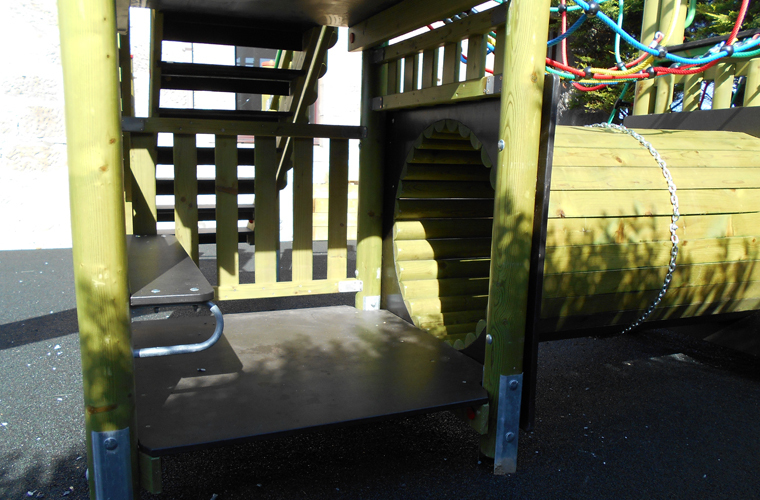 The lower deck barrel tunnel and seating provide an ideal introduction to adventurous play for younger children while the cargo net, climbing ramp and net bridge are more challenging for older children. The slide is accessible to all ages via the stairs. 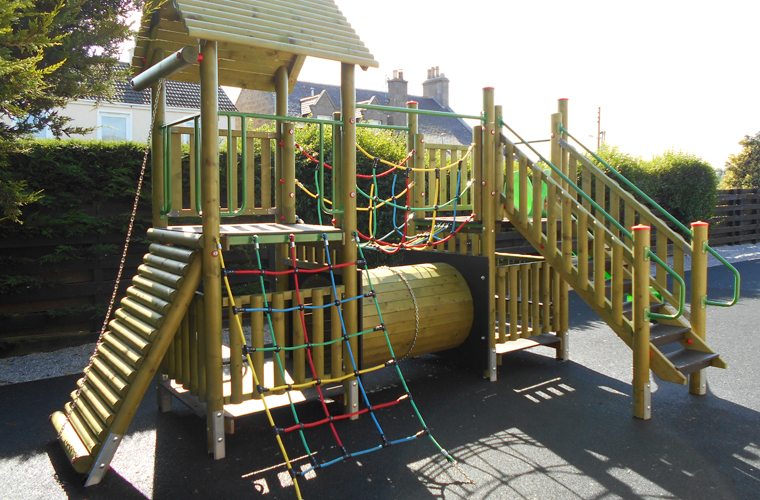 The stack of timber and rope provides a challenge for all children encouraging them to develop co-ordination and balance as well as their imagination. 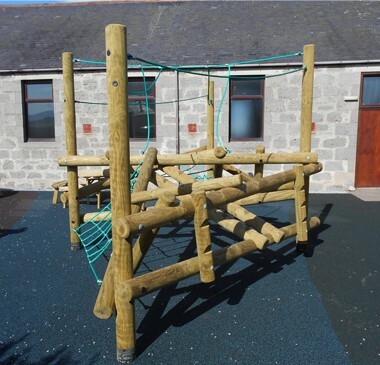 The basket swing is perfect and inclusive for many different users (often at the same time), with a 1.2m diameter basket which is stable for infants, as well as accommodating several adults - ensuring all users of the Community Hall can enjoy the swing. 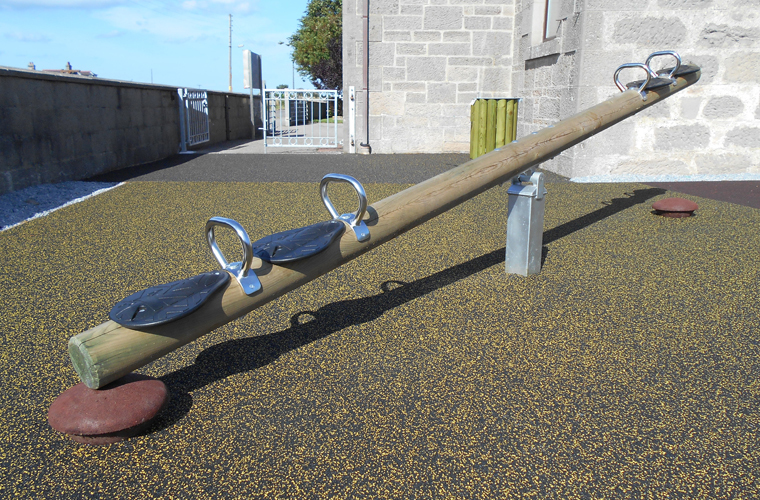 Always a popular and fun item, the seesaw has soft seats for comfort and durability. A unique hardwood timber post incorporating a 5x magnifying glass allows children to look at nature in a new way. A key part of increasing the accessibility of the outdoor area was encouraging all ages to enjoy the space. 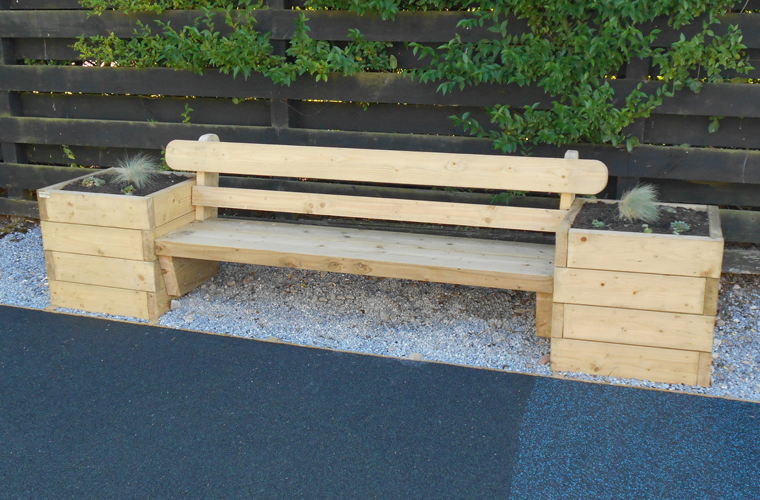 The sleeper bench provides a comfortable way for adults and children to watch the world go by with nature a little closer, growing in the planters on either side of the bench. The picnic tables with kidney-shaped seats allow all ages and abilities to sit comfortably without climbing over the seat. They can seat 8 adults and up to 12 children. For best practice and for visual interest, the Community Hall chose to install rubber wet pour surfacing in four different colours. 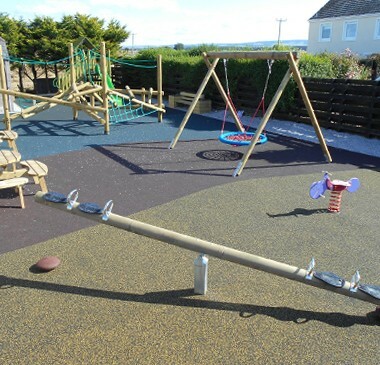 The area of surfacing exceeds the requirements for safety areas around play equipment and fulfils the EN-1177 safety standard for critical fall heights. 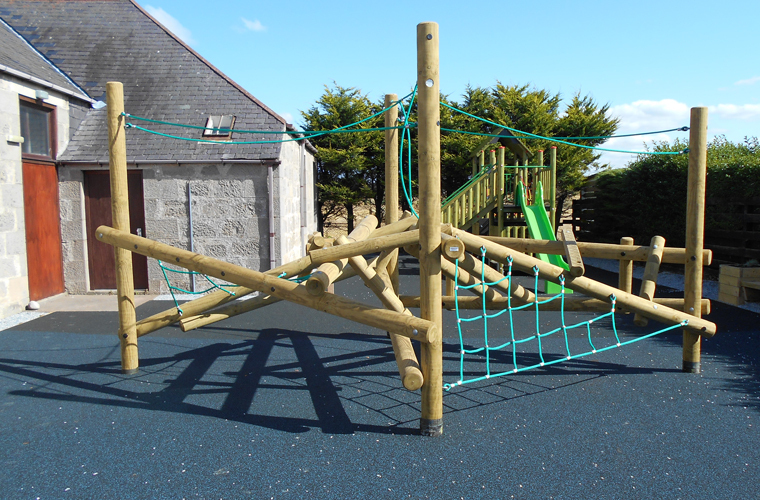 A representative of Spey Bay Community Hall contacted us in the summer of 2014 in order to develop their outdoor play provision. The existing equipment was limited as to who could use it with an infant swing seat, a simple slide and two springer units. The area could be better used and much more appealing to a wide range of people of all ages and abilities. We provided a proposal including a site plan and images of the suggested equipment so the Community Hall Committee had comprehensive information for a grant application to renovate and energise the area. 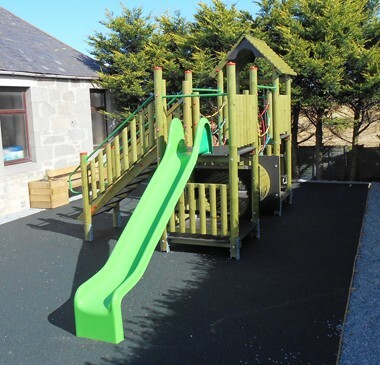 Early in 2015 Spey Bay Community Hall were successful with their funding application and received the funding so the project was able to go through top the next step which was finalising the exact layout of the playground by creating detailed proposal drawings and planning the installation. 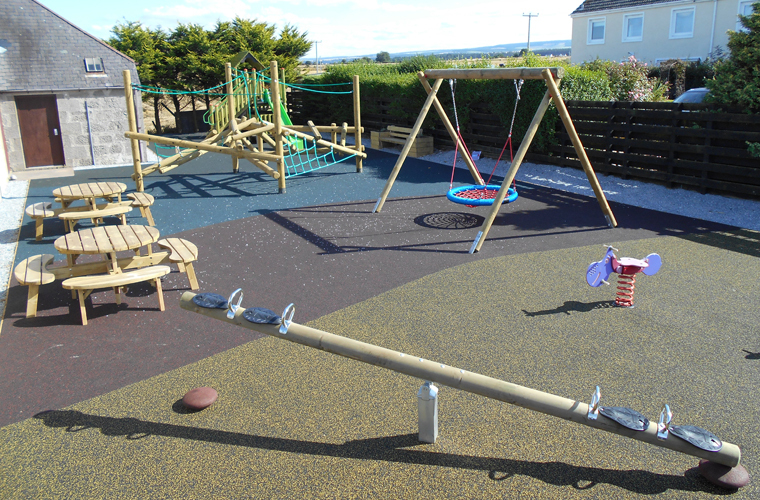 The playground equipment was successfully installed in the summer of 2015 and was ready and waiting for Spey Bay Community Hall’s annual fun day which included an official opening of the playground. 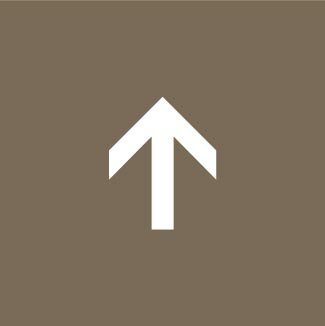 Have a look at other case studies here.